Midday satisfaction guaranteed with the new Bao SETisfy lunch deal now at Bao Today Hotel Rendezvous! 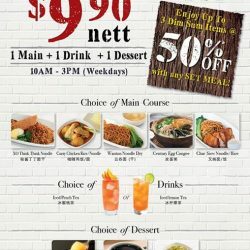 Enjoy a hearty 3-course set for only $9.90 nett and what's more, enjoy 50% off our handmade dim sum (up to 3 selections) with purchase of the set meal. Bao Today @ Hotel Rendezvous: Dim Sum buffet is back by popular demand from $16.80! 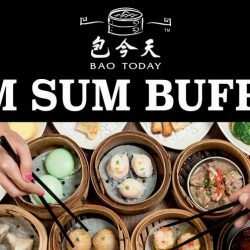 Bao Today @ Hotel Rendezvous Dim Sum buffet is back by popular demand! From only $16.80, we promise you a mouth-watering fare with more than 30 irresistable masterpieces and new chef specialities to choose from. All freshly handmade with premium ingredients that is definitely a bang for your buck. 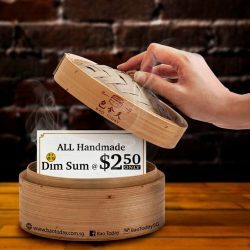 10th Anniversary Special: All handmade dim sum @ $2.50 only! Enjoy 28 mouthwatering selections of traditional dim sum delights made of only the finest ingredients! Highlights in the new menu include classics such as Steamed Prawn Dumpling and the highly raved Signature Salted Egg Yolk Bao. Promotion subject to availability. Other T&Cs apply. Check in-store for details.